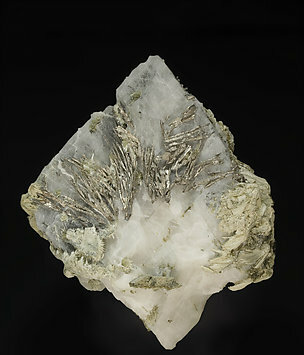 The Allargentum, as very well defined crystals, appears intergrown with Silver and Dyscrasite, forming dendritic growths on a Calcite matrix with fibrous aggregates of Actinolite. The Allargentum is dominant in the analysis so, following IMA recommendations, we label the sample in this way. We'll send a copy of the analysis to the buyer. 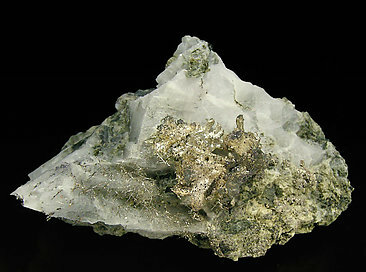 The Allargentum, as very elongated crystals, appears intergrown with Silver and Dyscrasite, forming dendritic growths on Calcite matrix and with centered growths of acicular crystals of Actinolite. 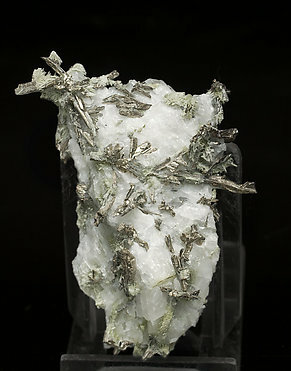 The Allargentum appears as dominant on the analysis, so, following the IMA recommendations, we label the sample as this. We’ll send copy of the analysis, both of the Allargentum and the Actinolite, to the buyer. The specimen has been reviewed and published in the magazine ‘Lapis’ on page 32, volume 35, number 11, November 2010. A novelty at Tucson 2010. 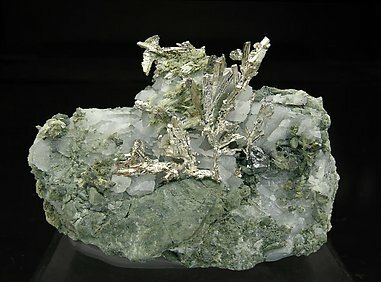 The Allargentum appears intergrown with Silver and Dyscrasite. It is clearly differentiated and dominant in the analysis of the sample, so the right label is Allargentum. 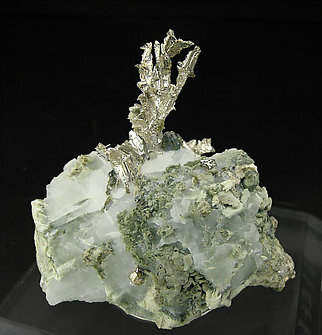 The Allargentum forms arborescent growths on a Calcite-rich matrix with small groups of Actinolite and thin filaments of a not analyzed metallic mineral. We’ll send a copy of the analysis. A novelty at Tucson 2010. 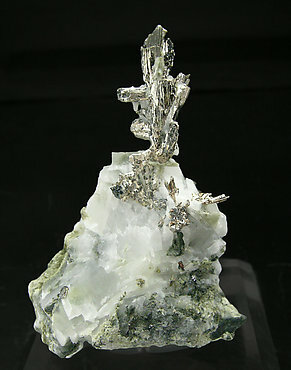 The Allargentum appears intergrown with Silver and Dyscrasite. It is clearly differentiated and dominant in the analysis of the sample, so the right label is Allargentum. 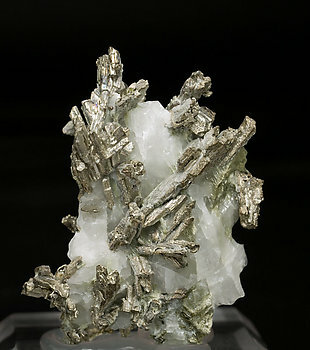 The Allargentum forms arborescent growths on a Calcite-rich matrix with small groups of Actinolite. We’ll send a copy of the analysis. The specimen has been reviewed and published in the magazine ‘Lapis’ on page 33, volume 35, number 11, November 2010.